Hey guys, there is a thread like this on another forum and I know some of you know what I'm talking about. I just thought I would try to get one started here in KD. Just post up anything you might be working on. Hopefully we can keep it going. I'm just excited to be back working on knives after about a 3 month break, after the new baby and some other stuff I just put the hobby on the back burner. Got to do a little grinding today and it felt great, took a minute to get back into the swing of things. 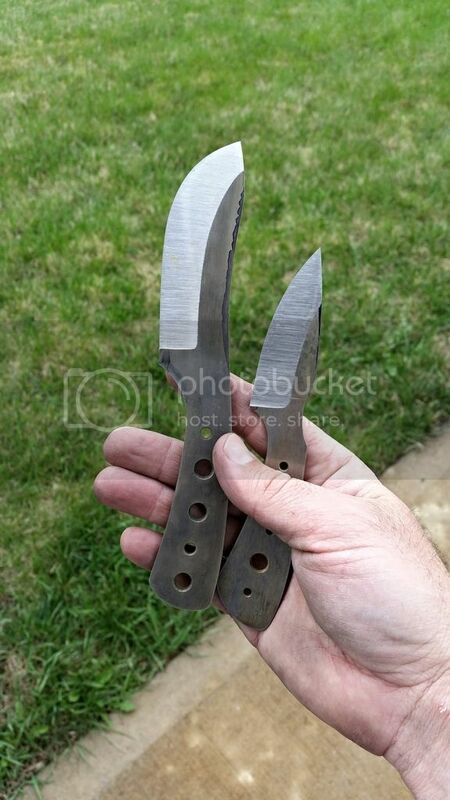 I also have a edge scribe I'm building that I will share once I get it done. Good idea for a thread. I'll have to snap some pics. 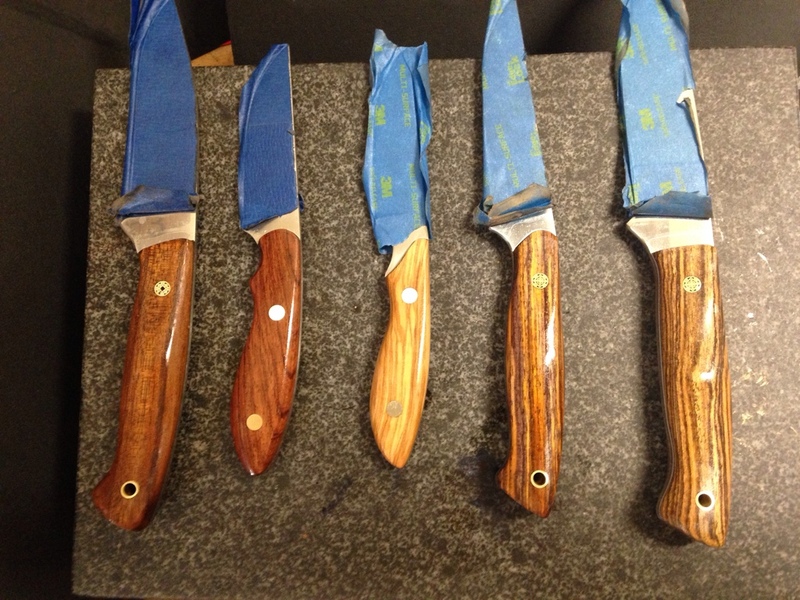 I've got 5 on the bench with handles being finished and sheaths cut and dyed. I'll stitch them over the weekend. Just sent 26 (!) blades off to Peters' last week. I need to get these 5 done and shipped before that big batch comes back from heat treat. Let's see if this works. Never tried posting a pic from my phone before. 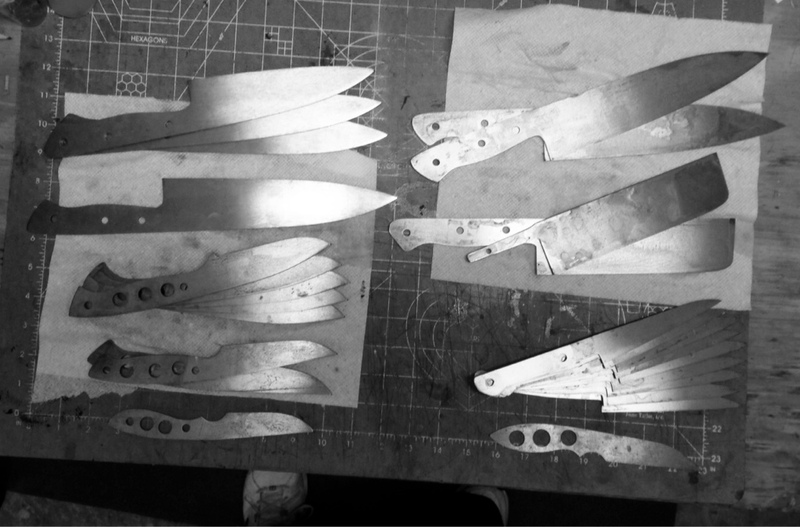 Those are the blades out for heat treat. Now we are talking, those look good John! And that is a heck of a batch going out some nice profiles. That turned out great Justin! lookes like it does to trick. My most recent homemade fixture. I got some shields and a template from BossDog almost a year ago and finally got around to giving it a try. My first practice piece I didn't get deep enough, but after that they are turning out pretty good. This homemade handle material is also a first. I call it "Partly Cloudy, Country Fiber" :biggrin:. It looks very similar to a store bought version costing and arm and a leg. I probably have $10 total in three 12 x 9 sheets. That scribe is exactly what I was looking for when I needed a scribe. 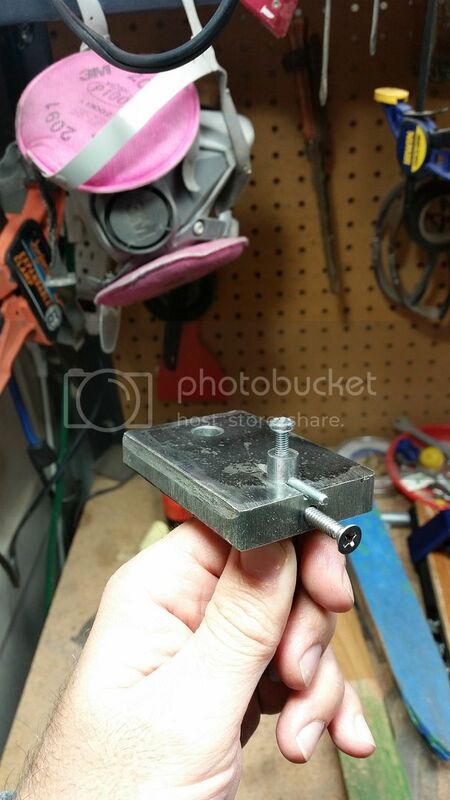 I could not find anything like that for sale, and a hundred bucks later I ended up with a granite surface block and a height gauge with carbide bit... Now I feel stupid, and just a tad lazy. Nice work, guy! I love building my own tools too. Here's a crumby photo of what's on my bench at the moment. I'm making this one for my son who just earned his eagle scout award to commemorate the occasion. I got the blade ground last night, but didn't get any pics. Still a little ways to go, but it's coming along. Nice job Justin,I have a couple knives on the bench,I just finished a 3 day clean up in the shop,still have one more work station to clean out.Headed to town today to pick up my new mill ! Justin, Good job on the center line marker! 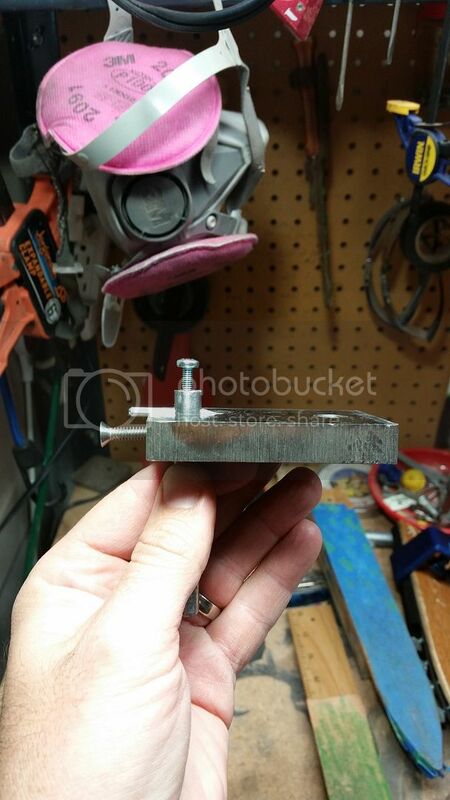 It doesn't have to be pretty to use in the shop, It just has to work! John, Nice pile of kitchen cutters and I do love that Bocote wood! I will have a few pic tomorrow of progress on the bench. Have some sharpening accounts to tend to today. Why, thank you sir! 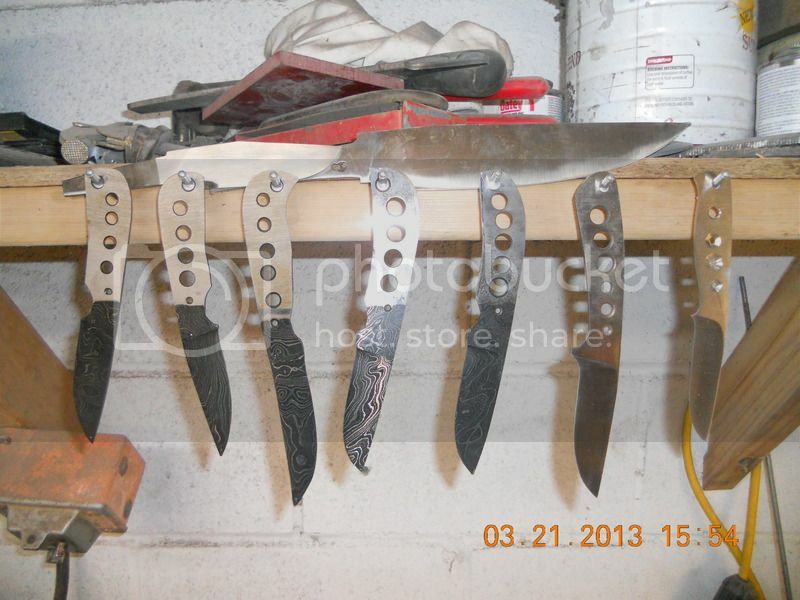 That pile of kitchen knives was two straight days of profiling. I don't want to profile anything else for a long time. I'll tell you what- I TOTALLY GET the value in having blanks water jetted now. Thanks again for turning me on to the VSM belts. I did all of those with a single 36grit and dressed them up with another single 60grit. That's about ten bucks total in belts to profile 26 blanks. 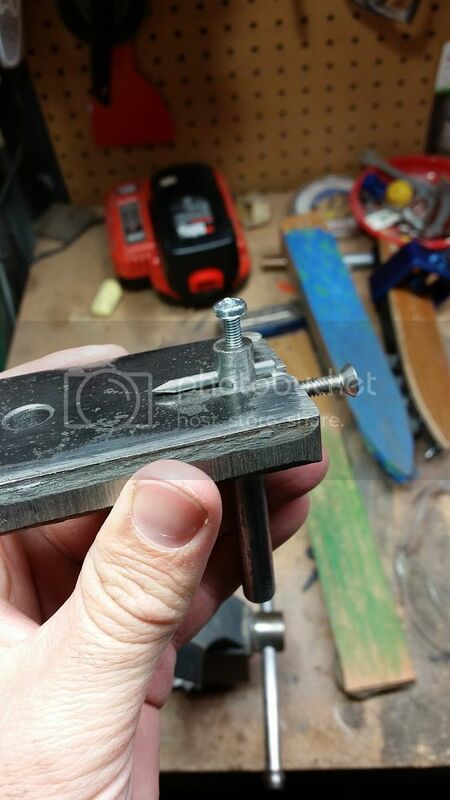 And it's not like I threw the belts out- they're still good enough for rough work and the 60 is good enough for rough shaping handle material, since all it had to do was square up the rough 36grit cut along the profiles. That's the first time I've used bocote. That's a wood that will fool you, huh? It's ugly as sin as a blank block, but by the time you sand on it some it gets really nice to look at and the color turns considerably lighter. 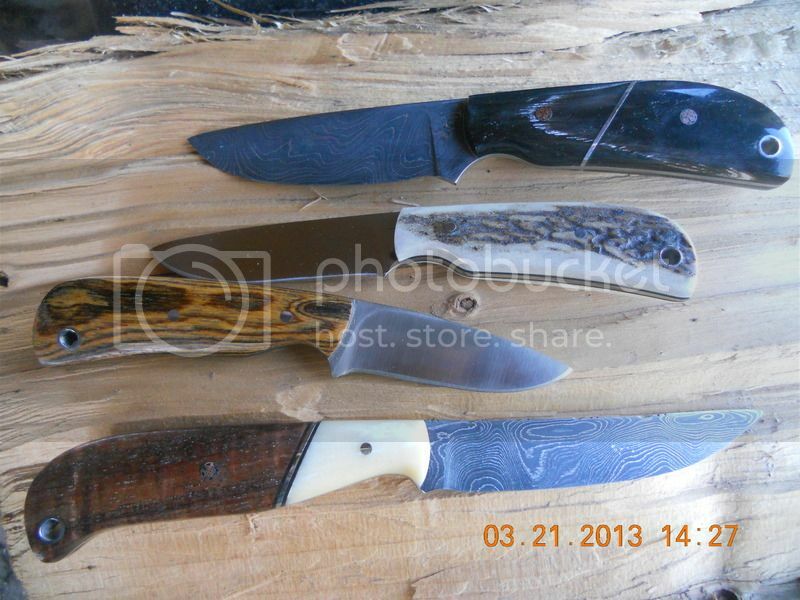 The guy I'm making that knife for is crazy about it, which makes me very happy. Those are purrrty! I haven't gotten brave enough to try segmented scales yet. I don't know exactly how to go about it. I've watched a bunch of youtube vids, but I don't have a rest for my disc grinder and I'm not sure I can get all those angles to fit together just right grinding by hand. Looking good guys! Glad to see this thread getting some traction. Making some more lock backs. 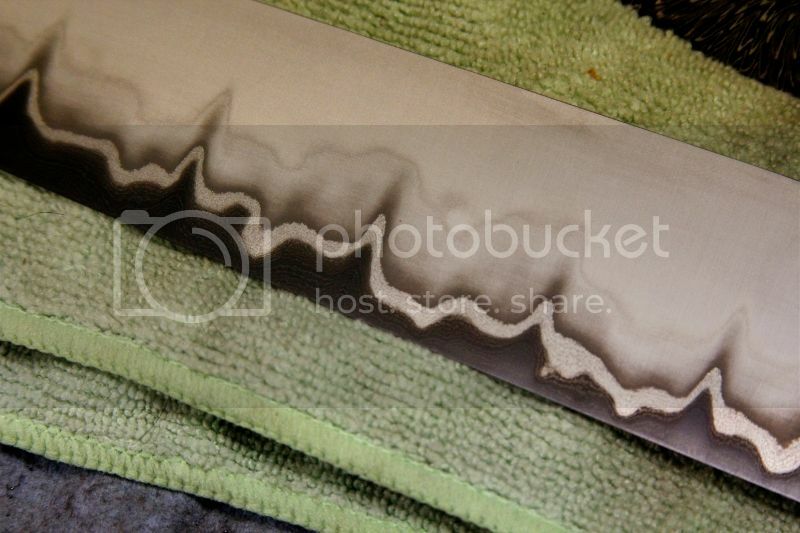 Hey, Randy, how do you get the very silver - clear top with the black core each showing so well? I have found that I get the best mileage out of belts by using the fresh belts for bevel grinding then at about 50% of the grit gone they get put into the rough and nasty work pile for profiling and just making metal go away when heat doesn't count. 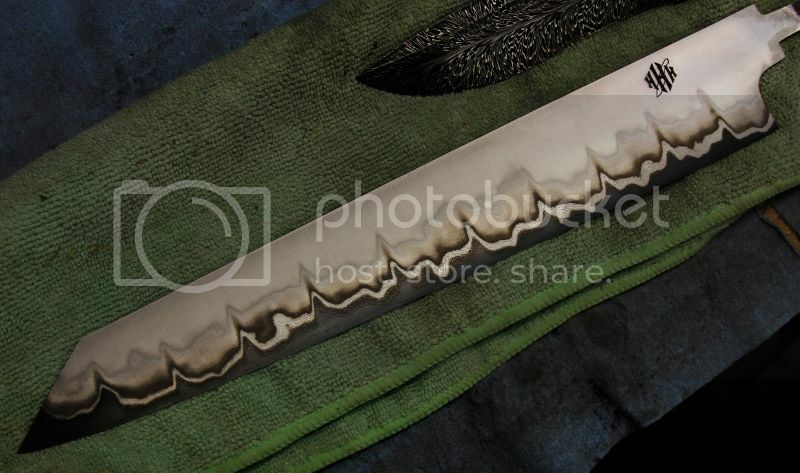 I only really do profiling on Damascus billets and a few mods on my set patterns. I have about 8-10 patterns and if one of them doesn't work for the customer usually we wouldn't work out together anyway. Besides as you have now discovered. Just doing profile work on a bandsaw and grinder is mind numbing! :drool: I feel like a real, mouth breather after an hour or two. 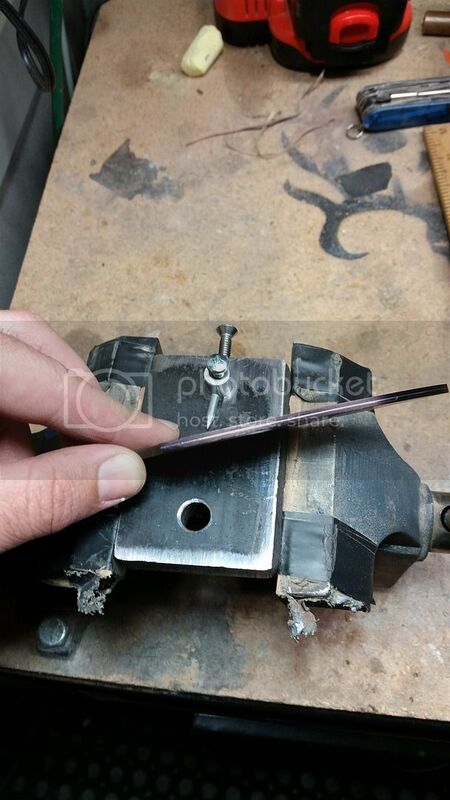 If you do some finger notching with Bocote you will expose all kinds of lovely grain. I'm sitting here trying to teach myself leather carving out of a 35 year old Tandy book. Supposed to be a flower, mine doesn't a look a whole lot like the book's. Just got some stamps and a swivel knife today, first try.